(Nanowerk News) Researchers at JILA have demonstrated the use of infrared laser light to quickly and precisely heat the water in "nano bathtubs"—tiny sample containers—for microscopy studies of the biochemistry of single molecules and nanoparticles. 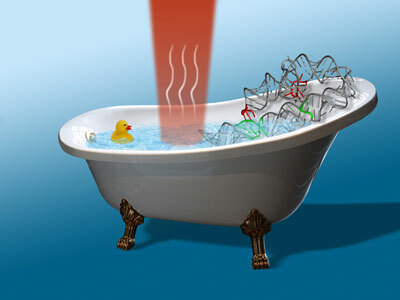 Infrared laser light heats the water in "nano bathtub" for JILA research on individual RNA molecules. Described in a new paper ("Real-Time Infrared Overtone Laser Control of Temperature in Picoliter H2O Samples: "Nanobathtubs" for Single Molecule Microscopy"), the JILA technique is faster, more controllable, and less prone to damaging expensive optics or accidentally altering chemistry than conventional methods using electric currents for bulk heating of microscope stages, optics and samples. The demonstration extends a technique used to study single living cells to the field of single-molecule microscopy. Fast, noncontact heating of very small samples is expected to enable new types of experiments with single molecules. For example, sudden, controlled jumps in temperature could be used to activate molecular processes and observe them in real time. JILA is jointly operated by the National Institute of Standards and Technology (NIST) and the University of Colorado at Boulder (CU). The JILA "bathtubs" consist of about 35 picoliters (trillionths of a liter, or roughly one-thirtieth of a nanoliter) of water on a glass slide. Gently focused infrared laser light is used to heat a nanoscale column of water. By moving the laser beam, this column can be made to warm single RNA molecules attached to the slide. The samples are mounted above an inverted fluorescence microscope, used to study folding of tagged RNA molecules (See for example, "JILA Study of RNA Dynamics May Help in Drug Design," NIST Tech Beat, July 13, 2005 at http://www.nist.gov/public_affairs/techbeat/tb2005_0713.htm#JILA). The researchers simultaneously heated and observed folding of the molecules, comparing results obtained with the laser heating technique to measurements obtained with bulk heating. The heating laser is directed at the samples from above, with the beam focused to a spot size of about 20 micrometers. The near-infrared light is just the right wavelength to excite vibrations in chemical bonds in the water molecules; the vibrations quickly turn into heat. The laser offers a much larger dynamic temperature range (20 to 90 degrees Celsius, or 68 to 194 degrees Fahrenheit) than bulk heating methods, according to the paper. In early trials, the technique controlled bathtub heating to an accuracy of half a degree Celsius in less than 20 milliseconds across a micrometer-scale sample area. "Exact sizes of the laser beam and sample area don't matter," says NIST/JILA Fellow David Nesbitt, senior author of the paper. "What's important is having time and temperature control over volumes of fluid small enough to be able to look at single molecules."